Do I need a structural survey? This article has been written by a surveyor who has experience in carrying out structural surveys and building surveys together with specific defect reports covering anything from structural problems, to damp problems to thermal efficiency and we also carry out independent valuations. If you have a property problem we may even already have written an article on it and we would refer you to the many articles we have on our home page 1stAssociated.co.uk. We use independent surveyors who are more than happy to chat. Please Free phone us on 0800 298 5424 and we will talk through your problem and explain the options to you. 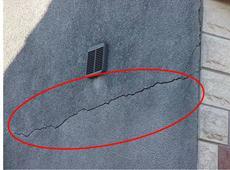 My wall is cracking and it doesn't look straight – what can the problem be? 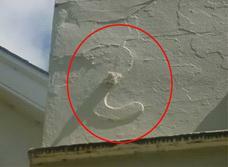 We are getting more and more calls from people that are noticing cracking in their walls. 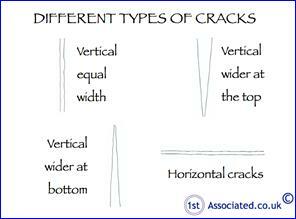 These can range from anything from a hairline crack to a larger crack of a few millimetres. The general rule of thumb is to seek advice and to only panic if you can literally get your hand through the gap! Is the crack the effect or is it the cause? We would always recommend where there is cracking that a Building Surveyor or a Building Engineer is asked to look at the property as a whole as the crack can often be the effect rather than the cause. When we are carrying out structural surveys or building surveys as they are now known, we often think of the surveys as a 3D puzzle where we have to check everything to ensure that everything is in the right place. It is where elements have been missed or have been amended that problems can occur; this can range from everything from world war damage to extensions and alterations by ‘professional builders', to DIY type alterations. If a building has been altered it can affect the structural stability of the building. Alterations can range from anything from replacement double glazed windows which don't have the same structural strength as the original windows to the removal of walls internally to make larger rooms without thought and adding in lintels. Sometimes a building can cope with one or two alterations and amendments particularly older buildings, sometimes it can't. It also depends upon the age, type and style of the building. 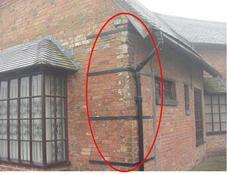 All of these things need to be considered by the surveyor carrying out a structural survey. It was during the course of a structural survey that we saw a bowing wall on a relatively old property which in itself didn't concern us on this particular age, type and style of property. The reason why it didn't concern us on this particular older property is we felt there is more than enough strength on it to hold this type of bowing or un-straight walls however as we pieced together the survey we realised that the reason for the bowing wall was not its age but because the gable end wall was not tied into the structure. Walls are tied into a structure by many elements; one of these is the floors. On older properties you may well see tie bars have been used where the lateral restraint or ties into the walls have deteriorated for whatever reason. Walls on the external of a property are relatively thin and take support and their stability from the corners within the property and also from the way the structure ties the walls together. Key elements that tie a building together include floor joists and roof joists. If you can imagine the framework of a building structure you should be able to see in your mind's eye the wall and the floor joists. 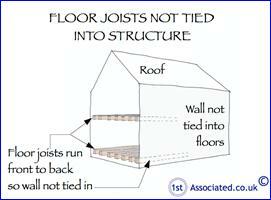 These floor joists then have dual function, as well as being floors and ceilings, of tying the whole structure together. When there is deterioration to the floor joists, for example, when they get damp, wet rot, dry rot or woodworm or when someone doesn't understand the structure and cuts joists away without adding in extra support, however there are also cases where there have been problems since day one and it is a very gradual movement process that takes place, that is until it gets to the tipping point when you start to get structural cracks within the property. 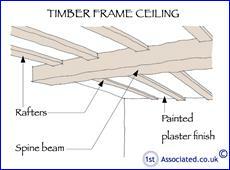 A good example of this is where the floor joists have been put in in different ways and don't tie the structure together. 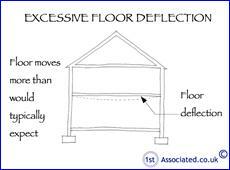 One thing that a good surveyor will note as they carry out their building survey is possibly too much deflection in the floor as you get very used to the weight of your own body when carrying out lots of structural surveys. This deflection could then indicate many things. 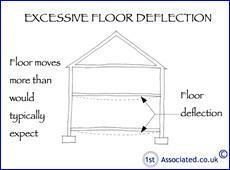 If for example the excessive deflection is just to the first floor this could be because walls have been removed or dampness has got into the end of the joists and started to rot it or it could be a combination of many things such as woodworm that has occurred. All of these type of things could result in cracking and bowing to the wall. In some older properties there will be deflection both to the ground floor and the first floor. 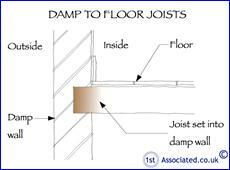 This then tends to be more a problem related to the joist sizes and the timber sizes and rotting to them or wet rot, dry rot or woodworm as well as other things. For example on the ground floor it could be a lack of ventilation under the floor and to the first floor it could be the removing and repositioning of a staircase for example. 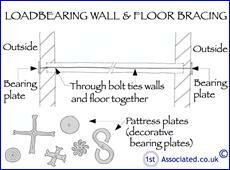 All of these things need to be considered when looking at why walls are bowing or not straight or cracking. This article has only touched upon the various different possibilities of problems that can occur in properties. As you saw earlier within this article there are many other articles that we have written which we have referred you to. If you are at all concerned please call us on 0800 298 5424. If you truly do want an independent expert opinion from a building surveyor, we are happy to do valuations, building surveys, structural surveys, structural reports, engineers reports, specific defects reports, home buyers reports or any other property matters. Please contact us on 0 800 298 5424 to have a free of charge friendly chat with one of our surveyors. We feel our surveys are quite unique, as they are specifically written to your level of knowledge. The surveys include photos and sketches and definitions. The survey will also include an action required section and an estimate of costs in the executive summary. We are more than happy to meet you at the property whilst carrying out the survey to discuss any specific issues you may have or have a general chat about what we have found at the end of the survey.